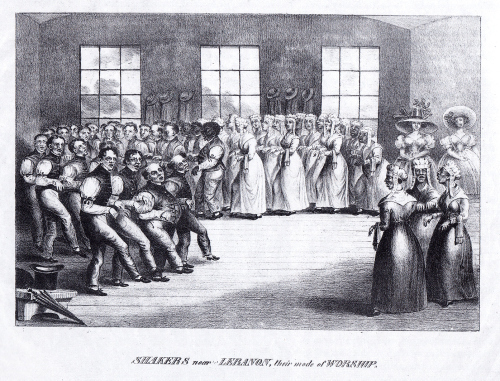 The Shakers built their first framed meetinghouse near New Lebanon, New York, along the Massachusetts border, in 1785; this structure assumed the central authority over the Shaker domain and became the architectural prototype for eleven other late–18th-century meetinghouses in New England. The design of these structures had several distinctive elements, including a heavy timber frame, a sturdy wood-plank floor, double façade doors for separate male and female entry, leadership apartments above the private gable-end door and stairs, carefully gendered spaces throughout, a gambrel roof, and a singular unobstructed ground-floor space to accommodate dynamic communal dancing during worship. This entry was posted in Uncategorized and tagged repost by jesseajohnston. Bookmark the permalink.